No subject is more intimately bound up with the nature of the gospel than that of law and grace. In the degree to which error is entertained at this point, in the same degree is our conception of the gospel perverted. An erroneous conception of the function of law can be of such a character that it completely vitiates our view of the gospel; and an erroneous conception of the antithesis between law and grace can be of such a character that it demolishes both the substructure and the superstructure of grace. Nothing could advertise this more than the fact that two of the major Epistles of the New Testament, and the two most polemic, have this subject as their theme. Our attention is irresistibly drawn to the gravity of the issue with which the apostle is concerned in his Epistle to the Galatians when we read at the outset, ‘But even if we or an angel from heaven preach to you any gospel other than that which we have preached to you, let him be anathema. As we have said before, so now again I say, if anyone preach any gospel to you other than that which ye received, let him be anathema’ (Galatians 1:8, 9). And we are no less startled when we read in the same apostle’s Epistle to the Romans, ‘I say the truth in Christ, I lie not, my conscience bearing witness with me in the Holy Spirit, that I have great sorrow and unceasing pain in my heart. For I could wish that I myself were anathema from Christ on behalf of my brethren, my kinsmen according to the flesh’ (Romans 9:1-3). What was the question that aroused the apostle to such passionate zeal and holy indignation, indignation that has its kinship with the imprecatory utterances of the Old Testament? In a word it was the relation of law and gospel. ‘I do not make void the grace of God: for if righteousness is through the law, then Christ died in vain’ (Galatians 2: 21). ‘For if a law had been given which could make alive, verily from the law righteousness would have been’ (Galatians 3: 21). ‘By the works of the law shall no flesh be justified in his sight’ (Romans 3: 20). 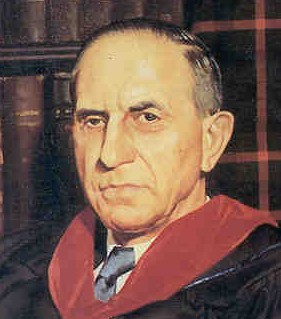 It is symptomatic of a pattern of thought current in many evangelical circles that the idea of keeping the commandments of God is not consonant with the liberty and spontaneity of the Christian man, that keeping the law has its affinities with legalism and with the principle of works rather than with the principle of grace. It is strange indeed that this kind of antipathy to the notion of keeping commandments should be entertained by any believer who is a serious student of the New Testament. Did not our Lord say, ‘If ye love me, ye will keep my commandments’ (John 14:15)? And did he not say, ‘If ye keep my commandments, ye shall abide in my love, even as I have kept my Father’s commandments and abide in his love’ (John 15:10)? It was John who recorded these sayings of our Lord and it was he, of all the disciples, who was mindful of the Lord’s teaching and example regarding iove, and reproduces that teaching so conspicuously in his first Epistle. We catch something of the tenderness of his entreaty when he writes, ‘Little children, let us not love in word, neither in tongue, but in deed and truth’ (I John 3:18), ‘Beloved, let us love one another, for love is of God” (I John 4:7). But the message oi John has escaped us if we have failed to note John’s emphasis upon the keeping of the commandments of God. ‘And by this we know that we know him, if we keep his commandments. He that says, I know him, and does not keep his commandments, is a liar, and the truth is not in him. But whoso keeps his word, in him verily the iove of God is made perfect’ (I John 2:3-5). ‘Beloved, if our heart does not condemn, we have confidence toward God, and whatsoever we ask we receive from him, because we keep his commandments and do those things that are well-pleasing in his sight . . . And he who keeps his commandments abides in him and he in him’ (I John 3:21, 22, 24). ‘For this is the love of God, that we keep his commandments’ (I John 5:3). If we are surprised to find this virtual identification of love to God and the keeping of his commandments, it is because we have overlooked the words of our Lord himself which John had remembered and learned well: ‘If ye keep my commandments, ye shall abide in my love’ (John 15:10) and ‘He that hath my commandments and keepeth them, he it is that loveth me’ (John 14:21). To say the very least, the witness of our Lord and the testimony of John are to the effect that there is indispensable complementation; love will be operative in the keeping of God’s commandments. It is only myopia that prevents us from seeing this, and when there is a persistent animosity to the notion of keeping commandments the only conclusion is that there is either gross ignorance or malignant opposition to the testimony of Jesus. The disposition to construe the demand for obedience in the Mosaic economy as having affinity with works rather than grace arises from failure to recognize that the demand for obedience in the Mosaic covenant is principially identical with the same demand under the gospel. When we re-examine the demand for obedience in the Mosaic covenant (cf. Exodus 19:5, 6; 24:7) in the light of the relations of law and grace in the gospel, we shall discover that the complex of ideas is totally alien to a construction in terms of works as opposed to grace. Obedience belongs here no more ‘to the legal sphere of merit’3 than in the new covenant. The New Testament believer is not without law to God but under law to Christ. He delights in the law of God after the inward man and he therefore reiterates the exclamation of the Old Testament saint, ‘O how love I thy law! it is my meditation all the day’ (Psalm 119:97). And he also is not forgetful that he who was the incarnation and embodiment of virtue, he who is the supreme and perfect example, said, ‘I delight to do thy will, O my God: yea, thy law is within my heart’ (Psalm 40:8). This article is from the Payton Lectures delivered by Professor Murray in March of 1955 at Fuller Theological Seminary.